If this was an on-prem installation I’m sure the ULS would be giving some huge clues as to what is up, but I was lucky enough to be using Office365 (I love the fact bugs are Microsoft’s problem to diagnose ). So the only way forward was to raise Service Request. So after some problem investigation with the Support guy we got to the answer. 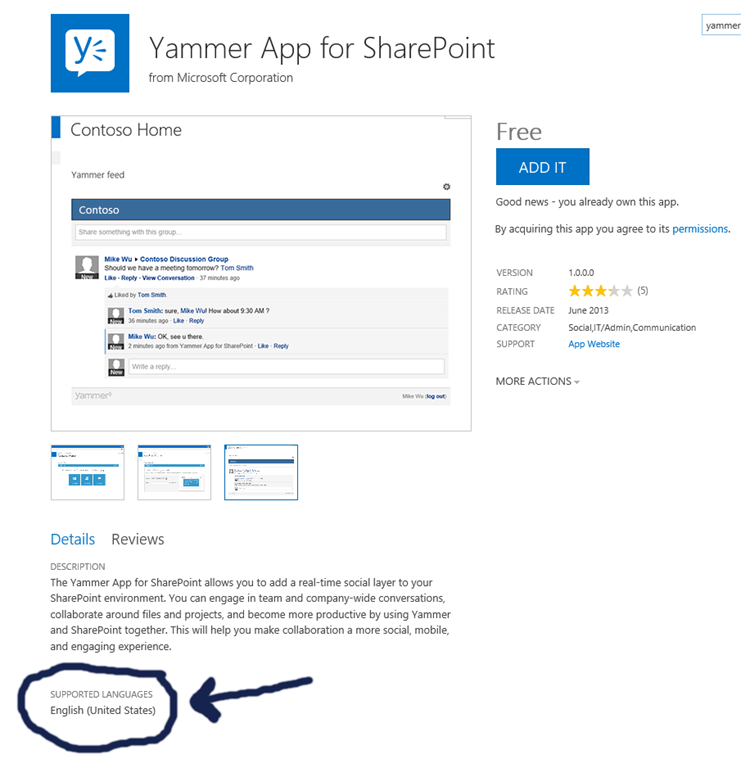 The key reason this App fails to install is the supported locales from Microsoft. As you can see from the screenshot below, only US English is a supported locale. Ok so nothing massively unusual there? Nope in SP2010 this is the only English available, but with SP2013 Microsoft finally worked out the UK uses ‘proper’ English with all it’s quirky spellings for things like ‘colour’. So with this in mind all of our tenant site collections are set to UK English as the locale, as you can see in the screenshot below. So when you add the app you think everything would be fine…. oh how wrong you’d be… So the add new app pops the ‘trust’ dialog. 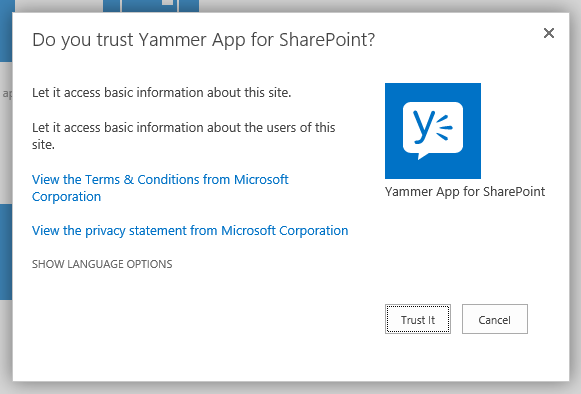 My first comment here is that it also includes the language options, so not really only about ‘trust’ is it. Second bad user experience here is that the languages selection is hidden by default. So being a typical user I didn’t read the information and clicked ‘trust it’. And that’s when the install error happens. 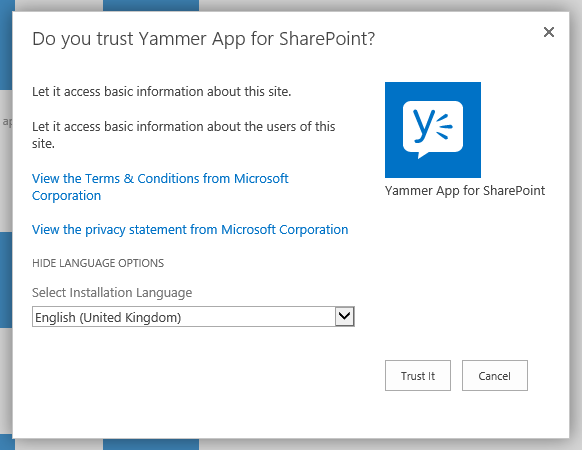 So the killer ‘feature’ is that the ‘Trust it’ dialog is picking up the current sites default locale (in this case English UK) and installing the app with that locale. Now if you remember the Yammer App only supports English US locale, so you need to select this locale from the dropdown. So now the app is installing with its supported English US locale into our English UK sites. 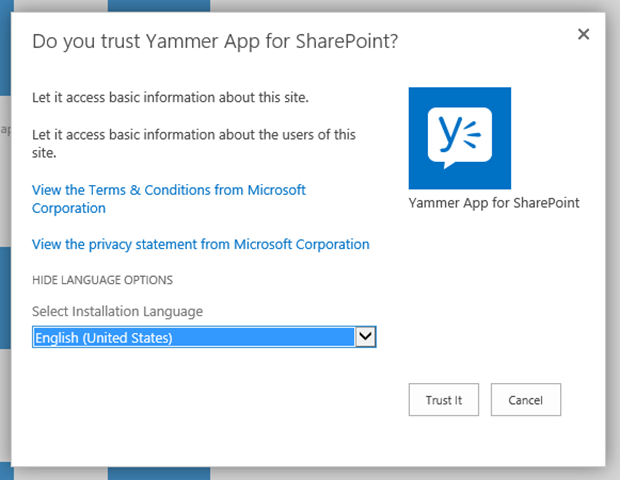 So our users get the language they want in most of SharePoint and Yammer works in it’s supported language. I think this is pretty bad that it defaults to install in a locale it doesn’t support and provides no feedback to the user. 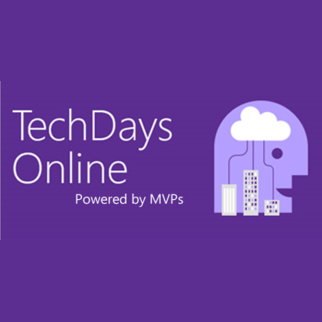 So this experience is littered with badly designed UX and errors which would be very easy to avoid, and thus wasting the time of both the user and MS Support. Lets hope someone fixes this in some later releases. I hope this saves someone the hassle of raising a ticket for something so simple. Thanks Wes. Came across the exact same issue over in Hong Kong. Keep up the good work. Why are you not an MVP already?